Is Phoenix, Arizona Safe or Dangerous? How Dangerous Is Phoenix, Arizona? If you are planning a trip to Phoenix, Arizona, and are concerned about your safety there are some things you should know. By the mid-1970s, Phoenix was close to or at the top of the list for cities with the highest crime rates. In response, the city's mayor increased the number of police and implemented crime aversion and reduction programs. There was an uptick in crime rates in the 1980s with increased gang activity. 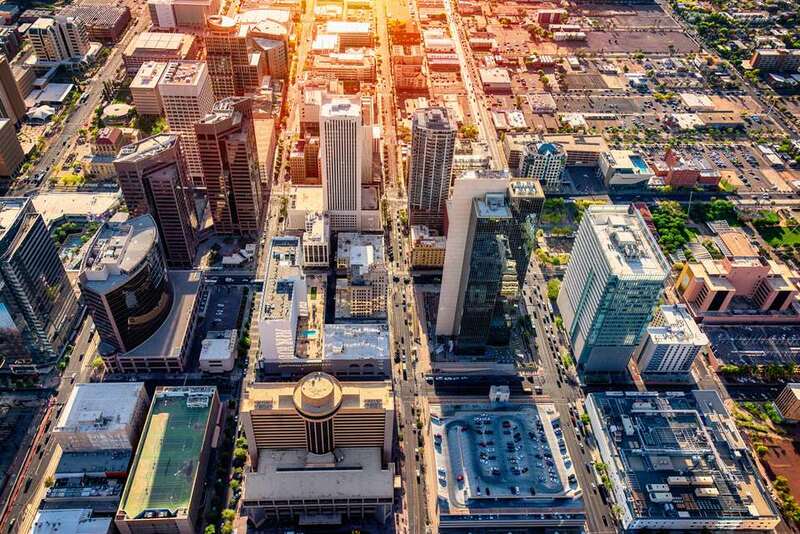 Phoenix is the largest city and capital of Arizona and the 6th most populous city in the United States with a population of almost 7 million. As a major city, the crime rates are of concern to travelers. In general, violent crime has been declining in Phoenix since the 1990s. Although crime has been declining, the city does experience occasional upticks of violent crime. Crime rates rise and fall by the year, and a single jump is not always indicative of a trend. When violent crimes occur, most are aggravated assaults, drug-related crime, and incidents involving illegal border trafficking. Like most cities, Phoenix has high crime areas and fairly peaceful areas that see little crime. The City of Phoenix maintains neighborhood crime maps and statistics. StreetAdvisor's listing of Phoenix neighborhoods will give you a sense of where the problem areas are. Areas like South Phoenix, as an example, are rated lower (more crime is one reason) and comments from residents indicate drug-related activity. The Valley of the Sun (Phoenix area) is made up of the city and surrounding communities like Scottsdale, Mesa, and Tempe. In the West Valley, seniors make up a great part of the population living in retirement areas such as Sun City, Sun City West, and Sun City Grand. Needless to say, these are very low crime areas. Affluent areas like Paradise Valley and Scottsdale have significantly lower crime rates than Phoenix or the smaller community of Tolleson to the east. Overall, City-Data.com reports that the Phoenix area has a higher crime rate than 89 percent of U.S. cities. On the whole, Phoenix is a relatively safe city for visiting tourists, except for one thing. Phoenix is in the top ten annually in the U.S. for auto thefts. So, if you are in the central area of Phoenix, lock your car and do not leave valuables visible in the car. Experts say one of the best ways to prevent theft is to pay attention to where you park a vehicle. Measures such as having a car alarm or parking closer to lighted businesses in parking lots can help prevent theft. Over the decades, murders in Phoenix have trended downward. Out-of-the-ordinary incidents do affect statistics. Notably, in 2016 Phoenix was plagued by a number of unrelated, multi-victim killings. A serial shooter claimed the lives of seven in 2016, and a 26-year-old man gunned down four members of his family before he was fatally shot by police. Most homicides are gun-related deaths, and many can be tied to drug activity. Knowing about the community where you are visiting and taking precautions to avoid high-crime areas at night, will reduce your chances of being a victim of violent crime. Aggravated assault is when an individual inflicts serious physical injury on another person. City-Data.com publishes crime data with year-to-year comparisons. In 2015 there were 5,113 assaults reported (327.8 per 100,000 people) and in 2017 there were 6,263 assaults (394.7 per 100,000 people) in the city of Phoenix. Aggravated assault has been trending upward since a dip in 2014. In Arizona, theft is defined as controlling another person's property with the intent to deprive them of the property and/or using another person's property or services for an unauthorized period of time. City-Data.com's data indicates that rates of theft in Phoenix are also trending upwards after a decline in 2014. In 2015 there were 34,288 property thefts reported (2,198 per 100,000 people) and in 2016 there were 37,568 thefts (2,368.8 per 100,000). Burglary, defined as entering a home or business to commit theft, showed an increase in numbers from 2015 to 2016 (with rates remaining stable), and down from 2014 rates. In 2015 there were 12,798 reported burglaries (820.5 per 100,000) and in 2016 there were 13,024 (820 per 100,000). Major hotels and resorts watch for changes in crime rates in the surrounding area and staff accordingly with security personnel and work to ensure that entrances are locked if necessary. Smaller, budget motels may not have the resources to beef up security in this way. Petty theft like pickpocketing does occur in the Phoenix area but should not be a major concern for visitors. Reports on the theft of wallets from women's purses in stores, for example, made the local newspaper. The best defense against crimes of opportunity like this is to watch your purse and not put a wallet in your back pocket. According to the Arizona Department of Transportation, in 2016 there were 463 fatal auto accidents in Maricopa County (Phoenix area) and in 2017 there were 479 fatalities due to car crashes. Despite the often crowded freeways and the speeds you might witness as hurried drivers pass you, Phoenix did not appear in the USA Today's 2016 Top Ten Most Dangerous Cities for Drivers. Phoenix freeways can get crowded. The morning rush hour can extend from 5:00 a.m. to 9 a.m. with the evening rush hour often lasting until 7:00 p.m. Driving in Phoenix will not be easy for those not used to freeway driving and not knowing where to find cross-city through routes.